We design our NON-MATRICULATED COURSES around the unique needs of today’s educator. Educators call our courses ‘highly practical,’ ‘collaborative,’ ‘inspirational’ and ‘eye-opening.’ Our MATRICULATED PROGRAMS, MEd in Educational Program Design and MEd in Educational Technology, offer small class size and a rich mix of theory and practice, ideal for designing and testing instructional ideas in real time. Our CERTIFICATES in the Arts, Inclusion and Educational Technology enable you to go deeper in your area of expertise. Our exceptional faculty bring deep collective REAL-WORLD EXPERIENCE to the classroom. Our three-credit graduate courses are equivalent to 90 Act 48 hours. The Master of Education in Educational Program Design is a 30-credit graduate degree designed to deepen your knowledge of quality educational program design. The MEd in Educational Program Design demystifies curriculum, instruction and assessment for educators, and provides the tools and builds the skills necessary to create and/or revise existing educational programming to meet the needs of today’s learner. The Master of Education in Educational Technology is a 30-credit graduate degree designed to deepen your expertise in integrating technology into classroom learning. Blending theory with practice, and aligned with standards established by the International Society for Technology in Education (ISTE), the MEd in Educational Technology arms you with a comprehensive understanding of technology in today’s learning environment. ENRICH YOURSELF. ENRICH YOUR CLASSROOM. 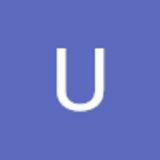 The University of the Arts has a long tradition as the regional leader in professional development that is current, applied, and distinctly tailored to the needs of Kâ&#x20AC;&#x201C;12 educators. Our courses, certificates and degree programs enrich and engage you as a learner, with a sharp focus on strategies and practices for you to take back to your classroom, school or district. We look forward to helping you meet your professional and personal goals. Begin earning your MEd in EDUCATIONAL PROGRAM DESIGN or EDUCATIONAL TECHNOLOGY this summer! FREE PARKING AT ALL LOCATIONS! 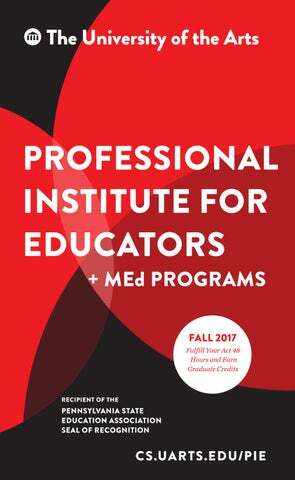 Courses offered in Fall 2017 by the Professional Institute for Educators at The University of the Arts in Philadelphia.